A new touchscreen interface adds to the already attractive package the Forester presents in the very competitive compact crossover category. With so much attention paid to compact crossovers of late, we’re lucky as consumers to see a rising tide lifting all boats. Truly every entrant in this category is worthy of consideration, with different manufacturers choosing to focus on style, off-road capability, or on-road manners. 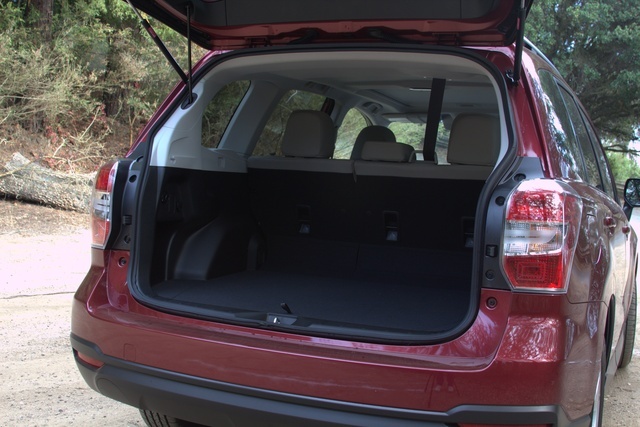 While the Forester won’t win any of those factors outright, it remains competitive in all of them and still offers nearly class-leading space and a close-to-perfect safety score. With a new touchscreen interface, things are even more attractive in 2016. With compact crossovers dominating the U.S. vehicular marketplace, the time is certainly right for checking out what these small SUVs can offer. While the Forester isn’t the showiest of the bunch, nor the most off-road capable, it offers a cross-section of competence that should leave any consumer content. A familiar sight on U.S. roads, the Forester is still reminiscent of the late-'90s models made popular by everyone’s favorite crocodilian-christened Aussie and stands as Subaru's most popular model. Interiors have improved and oil-burning issues have been solved, but there’s much to remind you of those first frenetic days of Subaru’s rise to glory. The Forester is now in its fourth generation, with a wealth of technological features and a stout 2.5-liter “boxer” engine that doesn’t suffer from any of the power problems plaguing models like the Crosstrek. Move up to the turbo 2.0-liter engine and you’ll enjoy one of the most powerful engines in the class. With six trim levels—2.5i, 2.5i Premium, 2.5i Limited, 2.5i Touring, 2.0XT Premium, and 2.0XT Touring—the Forester comes standard with a tilt-and-telescoping steering wheel, 6.2-inch touchscreen with the new Starlink interface and a rear-view camera, app integration, and an HD radio with aux and USB inputs. Premium trims add features like a power driver’s seat, sunroof, an upgraded stereo, and a larger 7-inch touchscreen with the enhanced Starlink system, plus an All-Weather package with heated mirrors and seats if you go with the manual transmission. Limited trims get all of the above plus automatic headlights and foglights, a power liftgate, leather, automatic climate control, and cosmetic enhancements, although at this level and above, you’re stuck with the continuously variable transmission (CVT). Go for the Touring and you’ll get 18-inch alloys, xenon headlights, an upgraded dual-zone climate control system, Harman Kardon 8-speaker stereo, and keyless entry and ignition. For those with more sporting intentions, the 2.0XT Premium also gets a sport suspension and a leather steering wheel in addition to the turbocharged engine. My week with the Forester was spent in a 2.5i Limited, which had a starting MSRP of $28,795. With the navigation system, upgraded Harman Kardon stereo, and the EyeSight optical safety system, the price increased by $2,145, and with an $850 Destination & Delivery charge, the total landed at $31,790. 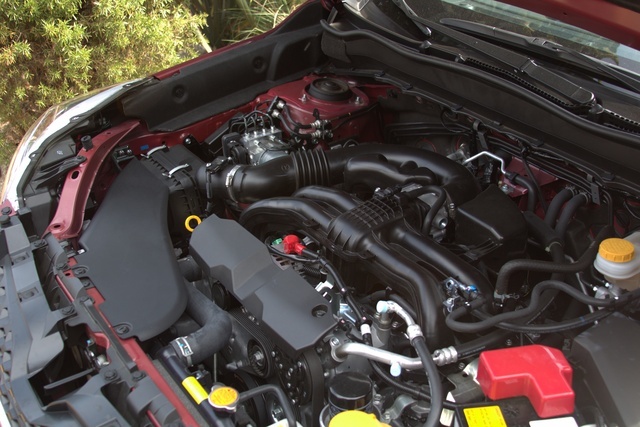 The Forester’s base 2.5-liter boxer engine delivers what should be plenty of power for its 3,500 pounds. With 170 hp and 174 lb-ft of torque, it should have enough oomph to move things along smoothly, but delivery is compromised by a janky CVT. The drivetrain delivers lurchy power down low and then struggles to offer the kind of passing power I’d expect from an engine with 170 hp and lb-ft. This makes city driving less than smooth and requires some passing patience on the highway. While the base 6-speed manual doesn’t seem to suffer from the same issues, I think a traditional automatic would be a better option than the CVT here. However, the CVT does manage to do well at increasing efficiency, with a combined 27 mpg from an EPA-estimated 24 mpg city/32 highway, versus the manual’s 22/29 for 25 combined. That aside, a CVT-equipped Forester will still make it to 60 mph in just 9 seconds, in line with most of its rivals. The turbo 2.0-liter’s 250 hp and 258 lb-ft of torque can manage the job in just over 6 seconds, but mileage will drop on the highway to 28 and rise around town to 23, for a combined 25 mpg, just like with the 2.5-liter equipped with the manual. Being a Subaru, the Forester's symmetrical all-wheel-drive (AWD) system must be mentioned when talking about performance. Keep in mind that while they are all called “Symmetrical AWD,” Subaru actually uses several different systems. Any Forester equipped with the 6-speed manual gets a system that defaults to a 50/50 front-to-rear power split. CVT-equipped Foresters are front-biased at 60/40, but either system can push 100% of the power to either axle. Additionally, 2.5i Limited and higher trims are fitted with X Mode, a system that works with the CVT to maximize traction below 25 mph. This locks the power split at 50/50 and optimizes the traction/stability control and even the throttle to avoid any slipping. Think of it as an “anyone can off-road” setting that’s best on dirt and snowy roads. Sitting in the Forester, I was immediately struck by how much Subaru's interiors seem to be improving. 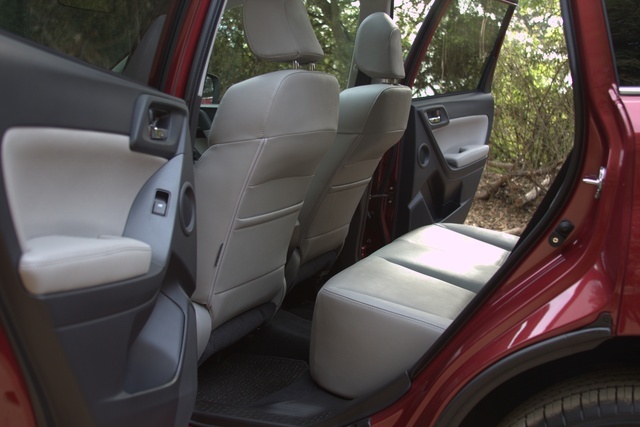 Soft-touch surfaces dominate the cabin, with an attractive yet simple design for the entire layout. You’ll see none of the excessive design that seems to be the sole respite of “flashier” competitors here, with Subaru opting for its usual updated classic approach. I do wish they’d lose the third screen that sits atop the dash, however. 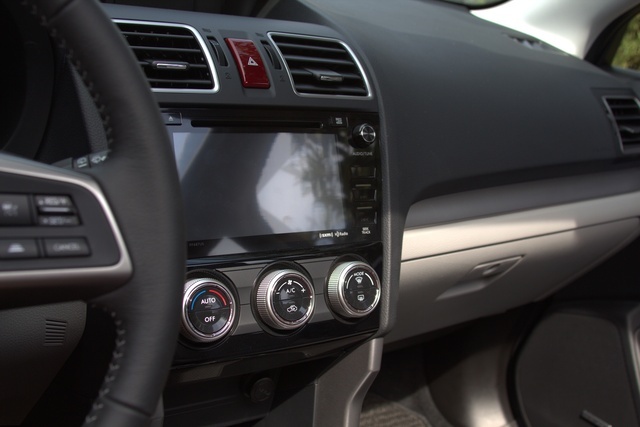 It doesn't provide any particularly pertinent information, at least nothing that couldn’t be consolidated into the touchscreeen or gauge cluster, and it’s a bit of a distraction. Head- and legroom are abundant even with the panoramic sunroof, which takes up a shocking 6 cubic feet of interior space. Still, even with that penalty the Forester manages nearly 70 total cubic feet, and that’s enough to stand out in the class. Seats are comfortable, but I’d like a bit more leg support. During hard braking or spirited cornering, I always felt right on the edge of falling off the cushion, and that’s dangerous. What the Forester has in spades is visibility. Thin pillars and wide windows mean blind spots are nearly absent, which is good considering blind-spot monitoring and alert won’t be available until next year, which might be a reason to hold out for a 2017. With the new Starlink system, the Forester gets smartphone app integration and an updated interface, and things are mostly an improvement. Pinch and drag functions are nice here, but a little slow to respond, unlike regular touchscreen inputs, which happen quickly and accurately. Phone pairing is accomplished through MirrorLink, and while I had no issues with the system, I’ve read of many users encountering compatibility issues with different phone models, so make sure to test it with your phone. Also, the screen can easily wash out in sunlight, and with the panoramic sunroof this can get quite bad. That said, it’s a small price to pay for that gorgeous open ceiling. Despite the strange omission of any blind-spot monitoring or alert, the EyeSight system works well for adaptive cruise control, lane-departure warning, and forward-collision avoidance, but as it’s an optical system and uses stereoscopic cameras in the windshield, anything that blocks their view will disable the system. This includes not only snow, mud, and dirt, but even direct sunlight and heavy fog and mist can obstruct the view temporarily—enough to shut off the system for a few seconds. It happened only a handful of times during my week, but it’s happened with every Subaru I’ve tested that has EyeSight. The backup camera here is nice, especially as it's standard on all trims, but it’s one of the lowest-resolution cameras I’ve tested, and that’s something I’d really like to see Subaru address. In the era of HD screens nearly everywhere, it’s hard to justify the blurriness we get with this piece of hardware. 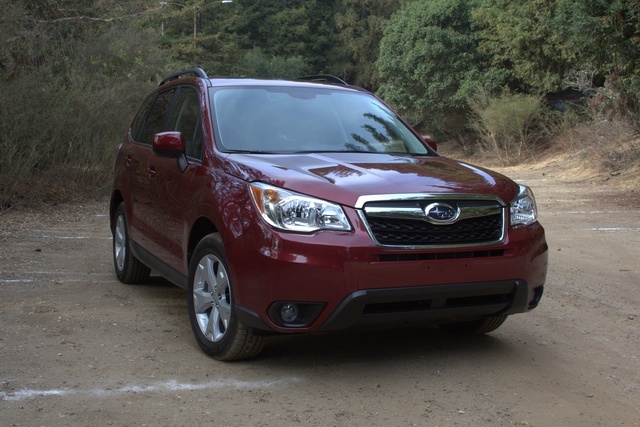 With a nearly perfect safety score, the Forester has a lot to brag about in this department, which makes it a class leader when it comes to families looking for a crossover. In fact, the only test in which the Forester didn’t receive a perfect score was the National Highway Traffic Safety Administration’s total frontal impact test, where the Forester was awarded 4 out of 5 stars. 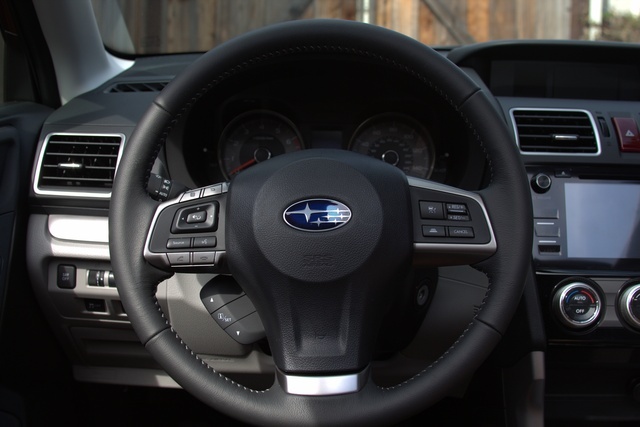 In addition to the usual standard of antilock disc brakes, a full suite of airbags, and traction and stability control, Foresters come with Subaru’s Starlink Plus telematic system, which provides automatic collision notification in case you’re unable to call 911 after an accident. Higher trims get an upgraded version that allows you to unlock doors, locate your vehicle, and get notifications if your alarm is activated, all from your phone. You can also add the previously mentioned EyeSight system, for a small amount of introductory autonomy. Braking is also impressive in the Forester, with different models fluctuating slightly in their 60-0-mph braking performance. The lightest trims can manage that feat in just under 120 feet, but tack on the options and bloat the weight, and you’ll add nearly 10 feet to that distance. Reliability ratings for the Forester have plagued it of late, with oil-consumption issues and recalls hurting the once-stellar reputation of this pioneering SUV. But Subaru claims it has killed the oil problem and extended warranties for those who were suffering its slippery wrath. Still, this could end up hurting resale values for this version of the Forester in the future. 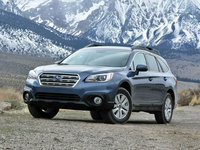 Otherwise, the Forester is near the top of its class with regard to 5-year ownership costs, and it’s really never hard to sell a Subaru, so I can’t imagine it being a large concern down the road. Currently, Subaru is not offering any financing or incentives on 2016 Foresters, but when the 2017s start coming out, you could start seeing deals being offered—something to look out for if you don’t mind living without blind-spot monitoring. 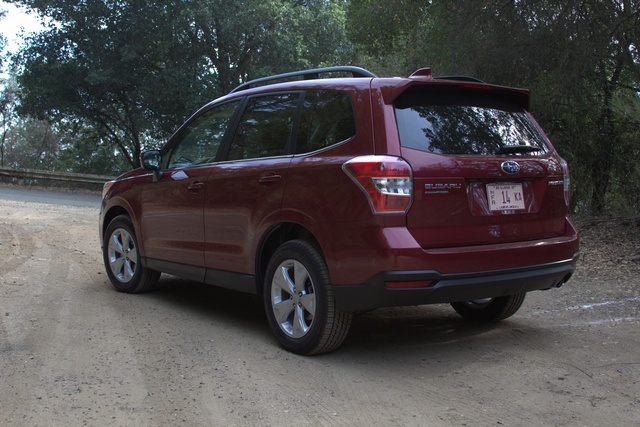 What's your take on the 2016 Subaru Forester? Users ranked 2016 Subaru Forester against other cars which they drove/owned. Each ranking was based on 9 categories. Here is the summary of top rankings. 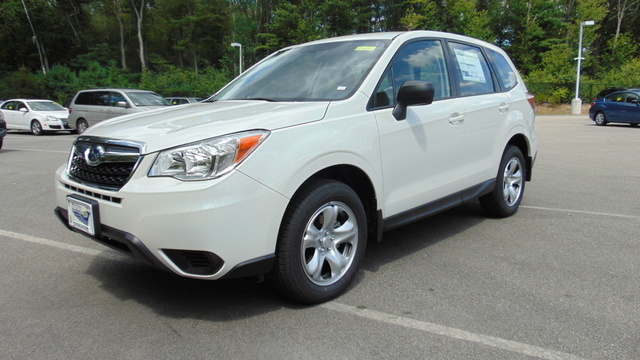 Have you driven a 2016 Subaru Forester? I poked a hole in the panel on the rear gate, how can I fix it?